Featured in the video clip above, which showcases the third game of the fourth quarter-final match-up, are Team 2067 – Apple Pi, Team 155 – Techno Nuts and Team 1699 – RoboCats (Red Alliance) vs. Team 1071 – Team MAX, Team 3525 – Nuts and Bolts of Fury, and Team 228 – Team GUS (Blue Alliance). Killingworth, Conn., May 17, 2014 – Capping a busy season for Connecticut’s high school-level FIRST Robotics Competition (FRC) teams, the Connecticut Association of Schools, in partnership with NE FIRST- Connecticut hosted the second annual FIRST Robotics Competition (FRC) High School State Championship on Saturday, May 17 from 8 a.m. – 5:30 p.m. at Haddam-Killingworth High School. Sponsored by the Northeast Utilities Foundation and Comcast, the championship provided FRC teams from the state’s high schools an opportunity to showcase the skills they’ve used to design and build their robots and participate in FRC events over the past four months. Thirty-four high school FRC teams from across the state competed at the state championship. 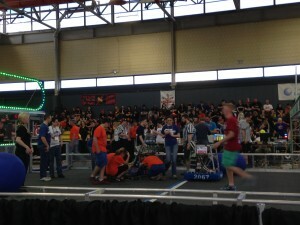 Teams again played AERIAL ASSIST, where eight alliances of three teams each maneuvered their robots to score as many balls in goals as possible during a two-minute and 30-second match. Additional points were earned by robots working together to score goals, and by throwing and catching balls over a truss suspended just over five feet above the floor as they moved the ball down the field. CT Choice Award went to Team 3525 – Nuts & Bolts of Fury, Waterbury. 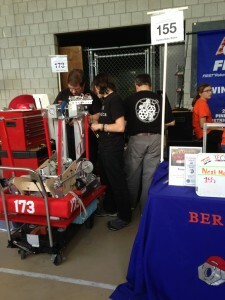 The winning alliance captain was Team 177 – Bobcats, South Windsor. On the winning alliance was Team 558 – Elm City Robo Squad of New Haven; and rookie Team 5129 – Digital Devils of Plainville. The runner-up alliance was comprised of Team 155 – Techno Nuts of Berlin, Team 2067 – Apple Pi of Guilford, and Team 1699 – Robocats from Colchester. Play of the Day Award went to Team 177 – Bobcats of South Windsor. Judges Award went to Team 3719 – The STEM Whalers, New London.